Traders work on the floor of the New York Stock Exchange on Thursday. Stocks plunged for the second trading day in a row but recovered late in the day. 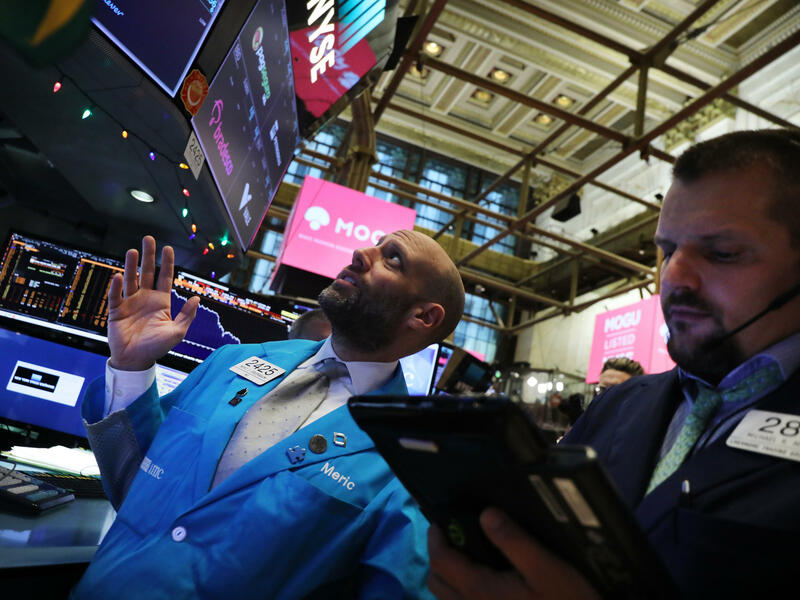 U.S. stock markets recovered most of their losses after plunging on reports that a Chinese technology executive was arrested in Canada. The arrest escalated U.S.-China tensions at a time when the two sides vowed to work to ease their trade war. At one point Thursday, the Dow Jones industrial average was down more than 750 points, or about 3 percent. But the blue chip index rebounded to close down 79 points, or about 0.3 percent. The S&P 500 finished the day up less than 0.2 percent and the Nasdaq composite closed up 0.4 percent. The bounce back came after The Wall Street Journal reported that Federal Reserve officials are weighing whether to "signal a new wait-and-see mentality" on interest rates after their Dec. 18-19 meeting. The stock market has been volatile this week. The Dow fell fell 799 points on Tuesday. U.S. markets were closed on Wednesday in honor of former President George H.W. Bush's funeral. Canadian authorities arrested Meng Wanzhou, the chief financial officer of Chinese telecom giant Huawei. A Canadian official said law enforcement took her into custody at the request of the U.S., which is seeking her extradition on accusations of violating its sanctions on Iran. The arrest comes at a delicate time, as Washington and Beijing are set to negotiate a deal that could diffuse long-standing grievances over trade. "I think investors are really worried about a global slowdown," Jack Ablin, the chief investment officer at Cresset Wealth Advisors, told NPR. In many respects, the arrest "personified the power struggle between the United States and China," he said. Huawei, which sells smartphones, has long been identified by the U.S. as a threat to national security. The Pentagon has alleged the Chinese government could use the phones to spy. Other pressures are weighing on the financial markets. This week, the interest rate on some short-term U.S. Treasury securities rose above that of longer-term instruments. Known as an inversion of the yield curve, this unusual phenomenon is something that hasn't occurred since 2007. Economists say it often signals a slowing of growth and perhaps even a recession. "Taking that on top of all this other news has really been a one-two punch for investors," Ablin said. The Fed has been raising interest rates as the U.S. economy recovers from the Great Recession, and it's expected to hike them again later this month. Investors have been looking for clues that the Fed won't be as aggressive in raising rates in 2019. And the price of oil has weakened amid signs of slowing growth in the global economy. "Notwithstanding all of this recent market turbulence, the market so far this year is essentially flat," Ablin said. "People tend to lose sight of that. ... It's not as dangerous from a longer-term perspective as it seems over the last few days."